Global brand campaigns require big-picture thinking. We handled even the smallest of details. 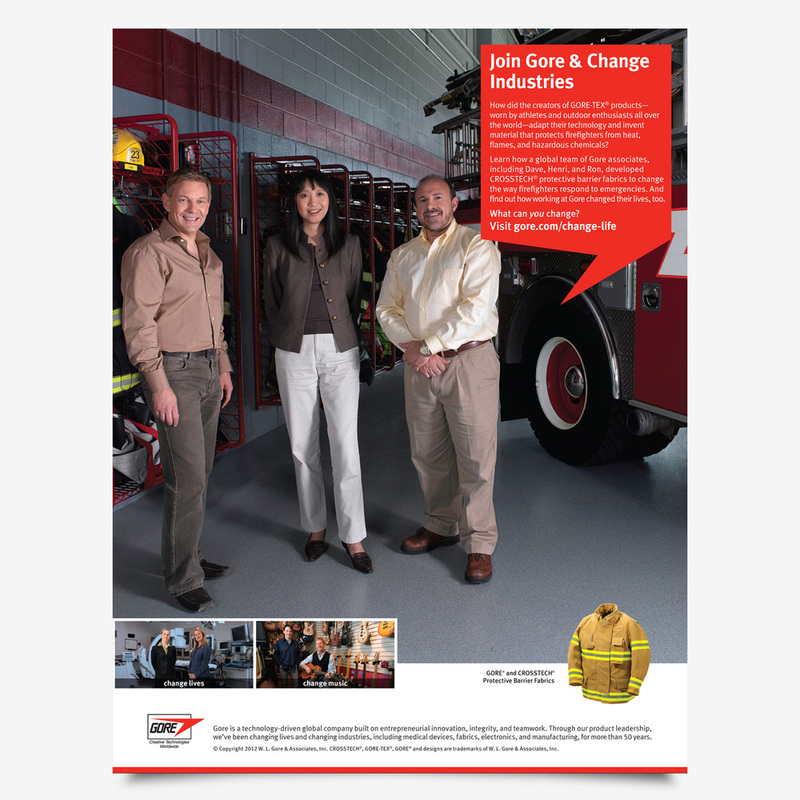 Building authentic stories for Gore's Employer Brand took us to exciting and remote locations across the US and abroad. During the process, we became guru's of the brand, or maybe sherpas... well you get the idea. Strategically it makes a lot of sense to shoot video during a photo shoot. So we did. 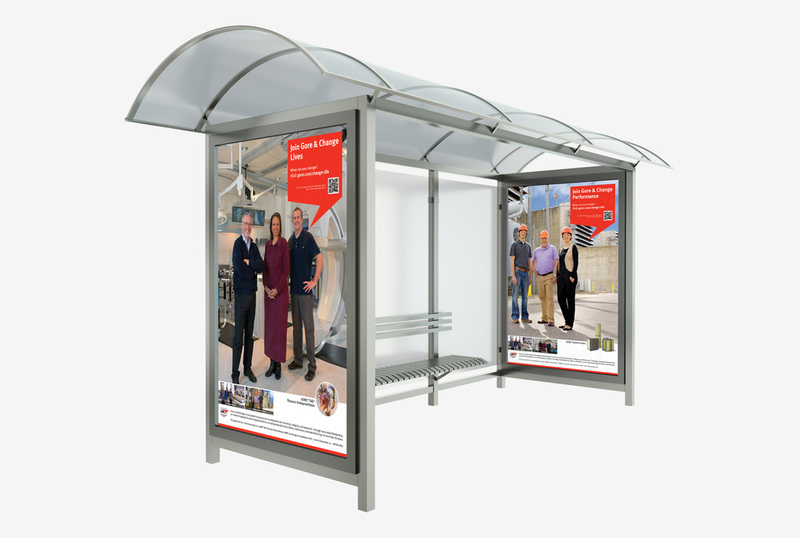 Designed to integrate perfectly into the whole campaign these associate stories appear online, on mobile, in presentations, and at job fairs. How did the creators of GORE-TEX® products— worn by outdoor enthusiasts and people with active lifestyles all over the world—invent a revolutionary stent-graft device that has saved and improved the quality of thousands of lives, then continue to work closely with vascular surgeons to maximize every patient's outcome? 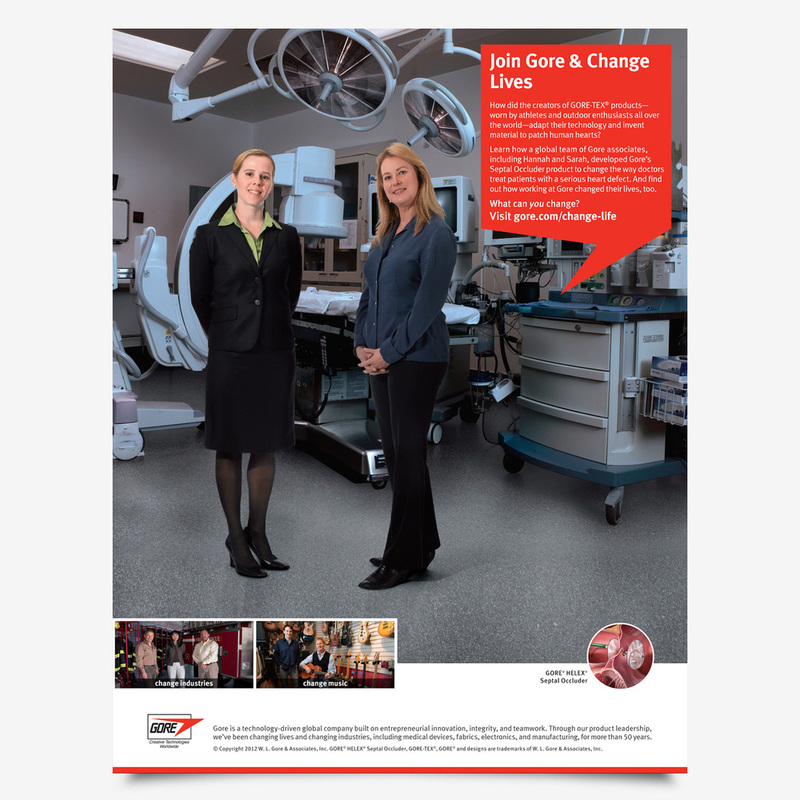 Learn how a global team of Gore associates, including Hajo, Alicia and Austin, collaborated to ensure the ongoing reliability and clinical performance of the GORE® TAG® Thoracic Endoprosthesis, which has changed the way physicians treat patients with Thoracic Aortic Aneurysms (TAAs). And find out how working at Gore changed their lives, too. How did the creators of GORE-TEX® products— worn by outdoor enthusiasts and people with active lifestyles all over the world—invent a unique, waterproof filter media for turbines that optimizes power output? 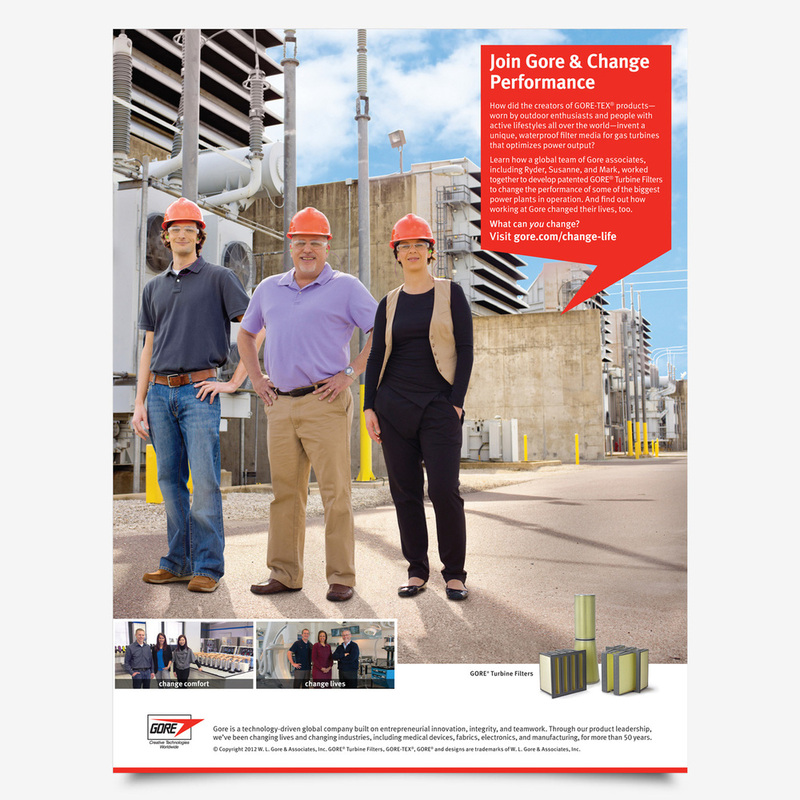 Learn how a global team of Gore associates, including Ryder, Susi and Mark, worked together to develop patented GORE® Turbine Filters to change the performance of some of the biggest power plants in operation. And find out how working at Gore changed their lives, too. How have the creators of GORE-TEX® products—worn by outdoor enthusiasts and people with active lifestyles all over the world—continually integrated new technologies into GORE-TEX® footwear to change the industry standard for comfort? 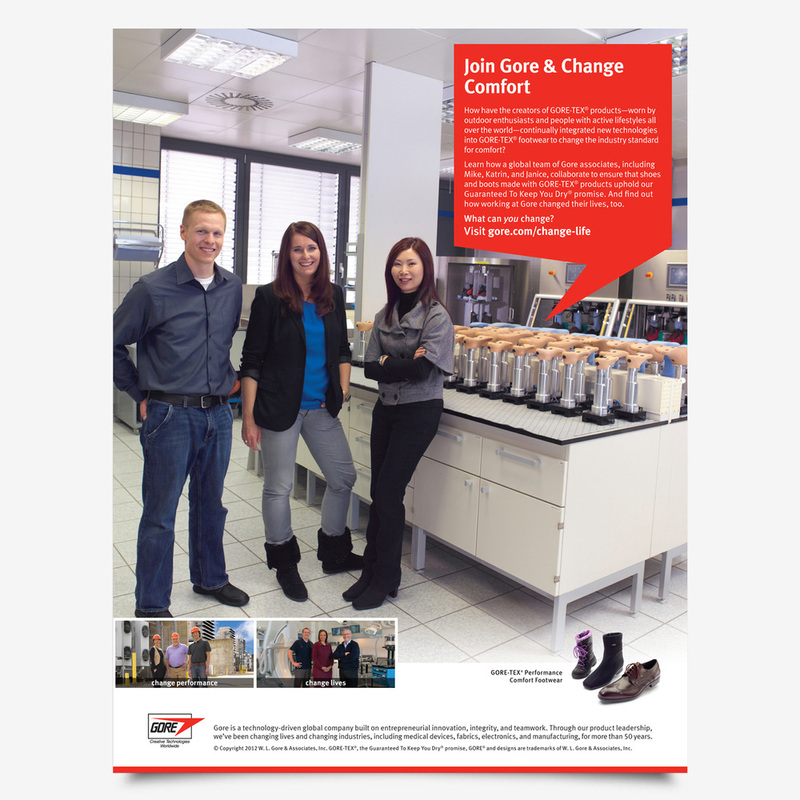 Learn how a global team of Gore associates, including Mike, Katrin and Janice collaborated to ensure that shoes and boots made with GORE-TEX® products uphold our Guaranteed To Keep You Dry® Promise. 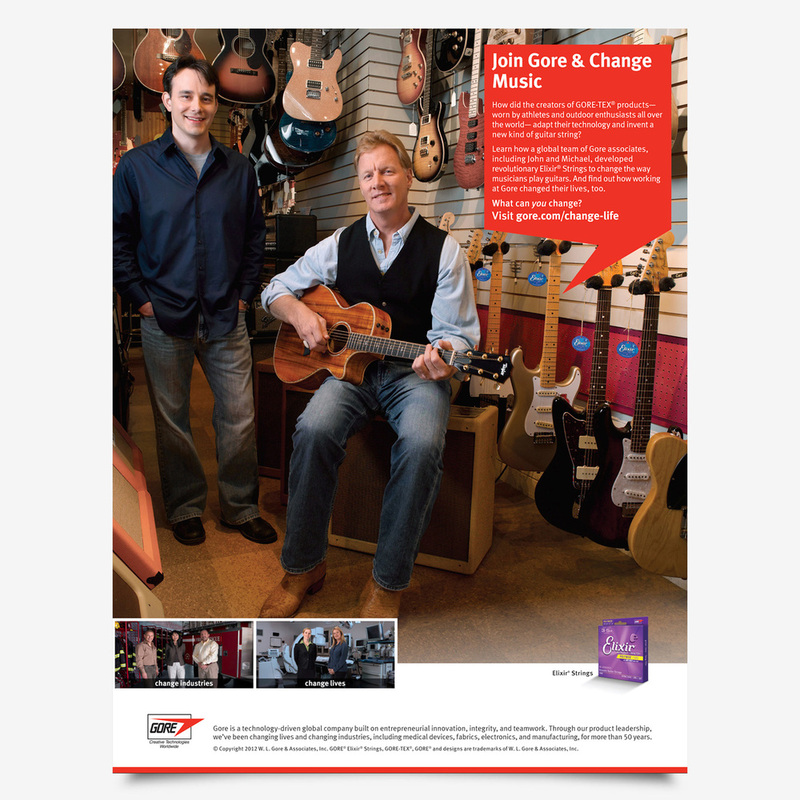 Gore is a complex company in its organizational structure as well as its diversity of products. The Employer Brand is responsible for representing all of Gore's unique attributes, culture, markets, product lines, and help you identify if you are a fit. We made it happen. 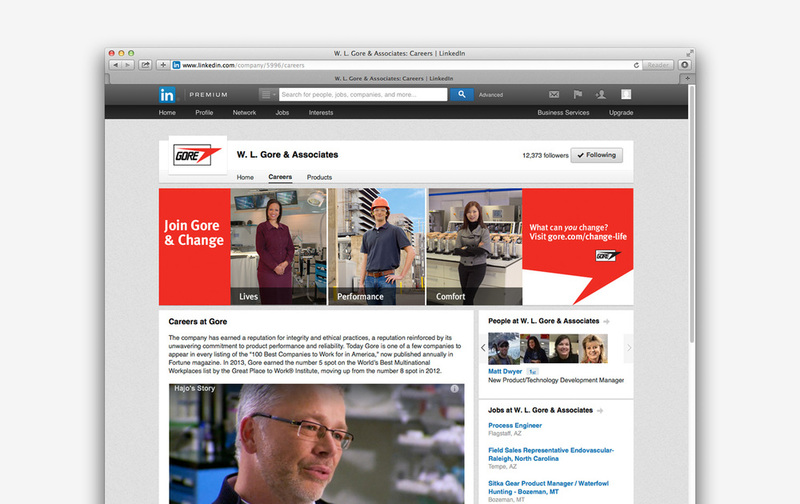 Gore has been one of Fortune 500's Best Places to Work, for fifteen years and running. Gore goes to great lengths to help candidates figure out if they are a good fit. 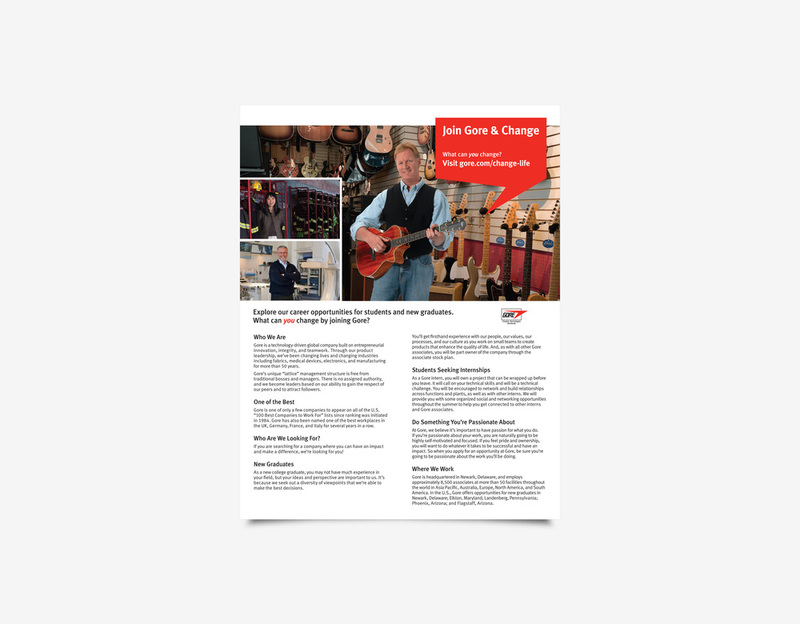 We developed a series of handouts designed to help interested candidates learn more during the process. 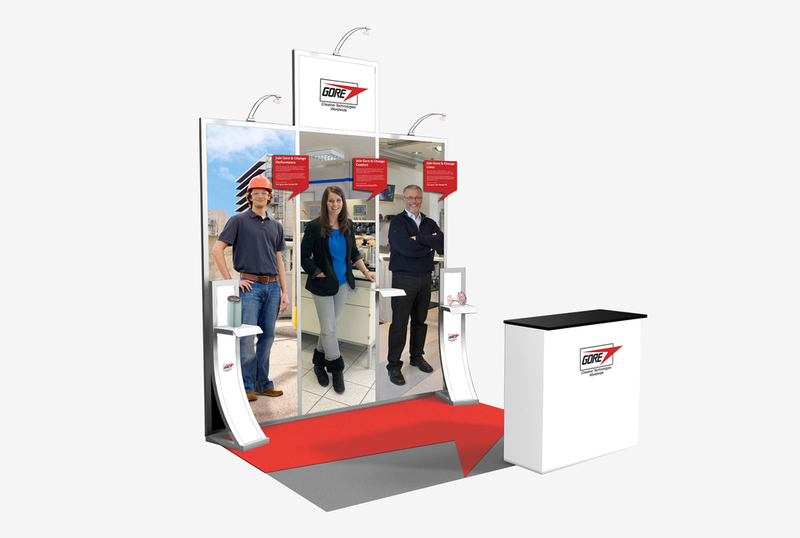 Crafting a brand message to be as portable as these booths, is second nature to us. We have more than two decades of experience designing and building brands and exhibits. This set of nine exhibits was custom designed and built with various options for national and global use. Complete with a branded carpet, custom product displays, interchangeable fabric graphics, dimensions up to fourteen feet high and twenty feet wide – and all that in a portable display that's a completely integrated part of the brand. Yeah, we do that. Every touch point is considered when developing comprehensive brand standards and their guidelines. In this case we considered downtown street side advertising as an option. Global rollout of the Employer Brand Framework was presented as a Prezi – available online as well as on a DVD.